If you are a lab supplier interested in marketing life science equipment and working to sell lab equipment at Alabama life science marketing events, Biotechnology Calendar, Inc.’s Birmingham BioResearch Product Faire™ Event on November 14th, 2013 may be something you’d be interested in. Biotechnology Calendar, Inc. events are very well-attended, and we organize them at schools where researchers have a wealth of funding available to spend on the latest and best lab equipment. 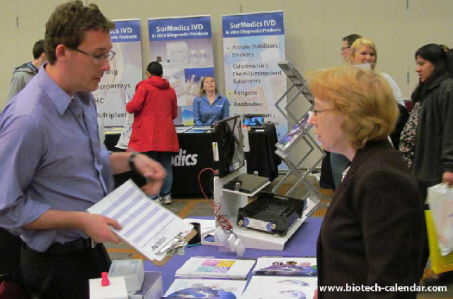 Last year, the Birmingham BioResearch Product Faire™ Event attracted 336 attendees. Of those who attended, 64 were purchasing agents, professors and post docs, and 62 were lab managers. The attendees came from 33 different research buildings and 45 departments across campus. Great sales reps know that at Biotechnology Calendar, Inc. shows, talking with customers or potential customers face-to-face is the best way to build a lasting relationship. A University of Alabama researcher who talks with a sales rep at one of our life science marketing events will get the opportunity to decide whether they would like to do business with a company, and how much business they would like to do, based on whether the sales rep takes an interest in their work and tries to help them find the missing pieces in their research process. Meeting researchers, lab managers and purchasing agents in person is the best way for lab suppliers to build trust in their company and successfully market life science equipment. However, simply canvassing and going from lab to lab on the University of Alabama campus is not nearly as effective as exhibiting at Biotechnology Calendar, Inc. life science marketing events. Researchers may be too busy to talk if a sales rep visits them in the lab, and they may not be in the right frame of mind to think about buying lab equipment. The time it takes to find each research building and walk around campus, visiting researchers individually, could also prevent you from having enough time to be able to show interest in their work. Our life science marketing events provide a comfortable atmosphere where researchers have purposely taken time out of their day to talk about new life science solutions. Lab suppliers marketing life science equipment and working to sell lab equipment may be interested in the latest funding statistics at the University of Alabama. In 2012, the NIH gave the University of Alabama $207.4 million. For a list of departments receiving funding from the NIH at the University of Alabama, please read our blog article Sell Lab Equipment at Alabama Life Science Marketing Events. The NSF also gave the University of Alabama $6.1 million in 2012. More NSF funding statistics on the University of Alabama are also included in the article linked to above. Biotechnology Calendar, Inc. is a full-service science research marketing and events-planning company that organizes life science marketing events at top research universities across the country. If you’re interested in marketing life science equipment and working to sell lab equipment at life science marketing events closer to home, we encourage you to view our 2013 calendar of events and 2014 calendar of events. For more information on the Birmingham BioResearch Product Faire™ Event, or to view more detailed funding statistics on the University of Alabama at Birmingham, click on the button below.